The Bharatiya Janata Party (BJP) said it received around Rs 437 crore in donations over Rs 20,000 in financial year 2017-18. It is not only the highest amount received by any political party in India during FY18, but also around 13 times greater than that received by all other national parties, according to the datacompiled by Association for Democratic Reforms (ADR). ‘National parties’ include the BJP, the Indian National Congress (INC), All India Trinamool Congress (AITC), Bahujan Samaj Party (BSP), Communist Party of India (CPI), Communist Party of India (Marxist) (CPM) and the Nationalist Congress Party (NCP). 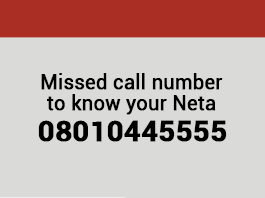 Laws on political funding in India do not mandate a donor’s identity to be declared for donations below Rs 20,000. Hence, donations made above Rs 20,000 assume significance. 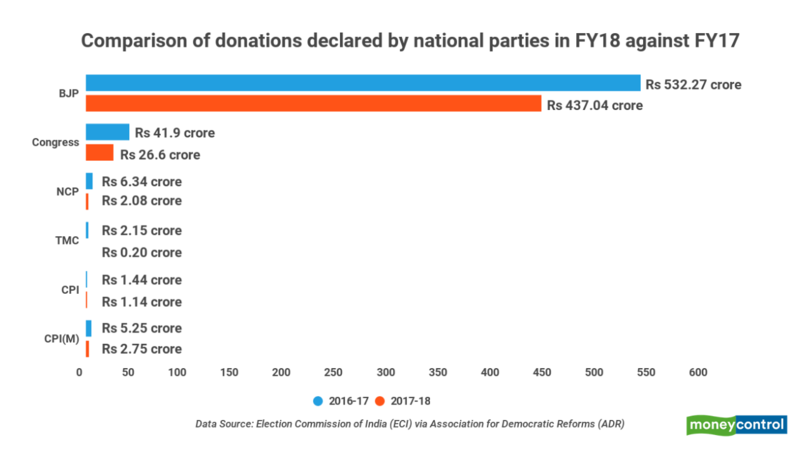 All national parties combined received donations worth Rs 469.89 crore from 4,201 donors as against 2,977 donors for BJP. Congress received Rs 26.658 crore in donations from 777 donors – a distant second. Sharad Pawar-led NCP declared donations worth Rs 2.087 crore from 42 donors and Mamata Banerjee’s Trinamool Congress received Rs 20 lakh in donations from 22 donors. The two Left parties -- CPI (M) and CPI -- declared donations of Rs 2.75 crore and Rs 1.14 crore from 196 and 176 donors, respectively. Mayawati’s BSP declared that it had not receive any donations above Rs 20,000 during the fiscal. It has submitted the same declaration to the Election Commission of India (ECI) for the last 12 years. Donations declared by national parties in the above Rs 20,000 category saw a dip of around Rs 119 crore in FY17. Donations received by BJP decreased to Rs 437.04 crore in FY18 from around Rs 532 crore in the preceding year. Similarly, donations received by Congress fell to around Rs 26.658 crore in FY18 from around Rs 42 crore in FY17 . Where are the donations coming from? Compilation by ADR shows that a significant chunk of the donations came from Delhi (around Rs 208 crore). This is followed by about Rs 72 crore and Rs 44 crore from Maharashtra and Gujarat, respectively. Around Rs 43 crore in donations came from either incomplete or undeclared addresses. Of the 4,201 donors, 1,361 came from corporates and the business sector. They donated a total of Rs 422 crore. 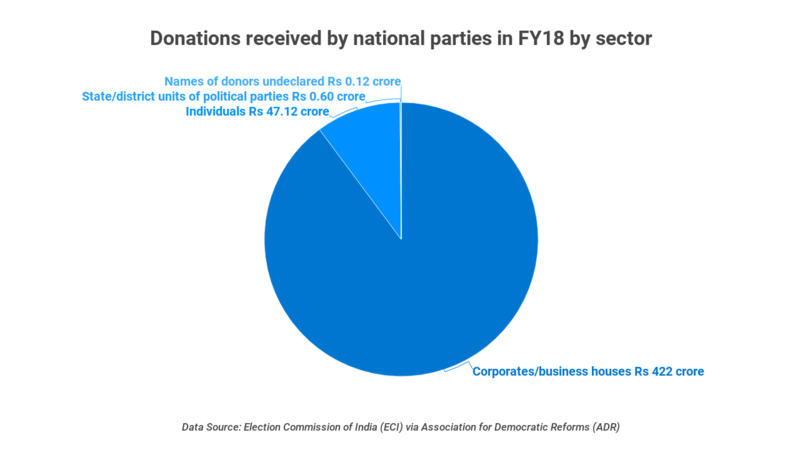 About 2,772 individual donors donated Rs 47 crore to six national parties during FY18. Prudent Electoral Trust was the largest donor to both BJP and Congress at about Rs 154 crore and Rs 10 crore, respectively, the data suggests.